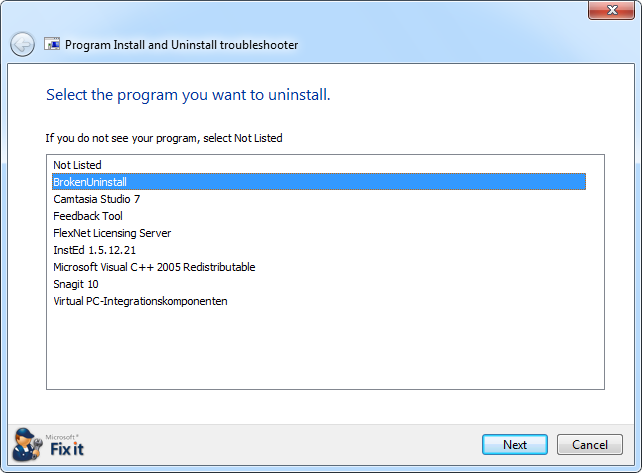 Several users are reporting that their InstallShield authoring tool stops working immediately after starting it. Apparently this is caused by an incompatibilty with Microsoft update MS14-037 “Security update for Internet Explorer versions 6, 7, 8, 9, 10, and 11” (KB2962872) which was distributed on this week’s Patch Turesday. Flexera is aware of the problem. A possible workaround is to uninstall the Windows patch, however this puts your system in an insecure, vulnerable state. Here’s a quick summary what’s new in the MSI engine that comes with Windows 8. According to Darwin Sanoy, Windows Installer also processes Appx Packages when installing Windows Store Apps. To access the real Windows\System32 folder (which – despite of its name – is reserved for 64 bit programs) a 32 bit application can use Windows\Sysnative instead. This functionality is included out of the box in Windows Vista and above. For XP and Server 2003 an update is available to add the sysnative functionality http://support.microsoft.com/kb/942589. 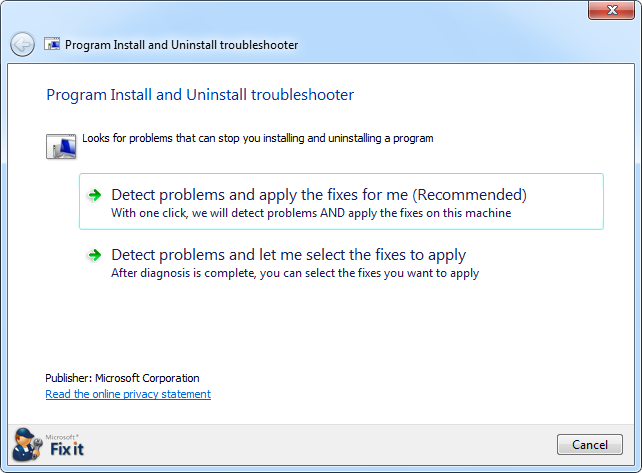 Microsoft has published a new tool to help end users fix setup related issues such as programs that can’t be installed or uninstalled. 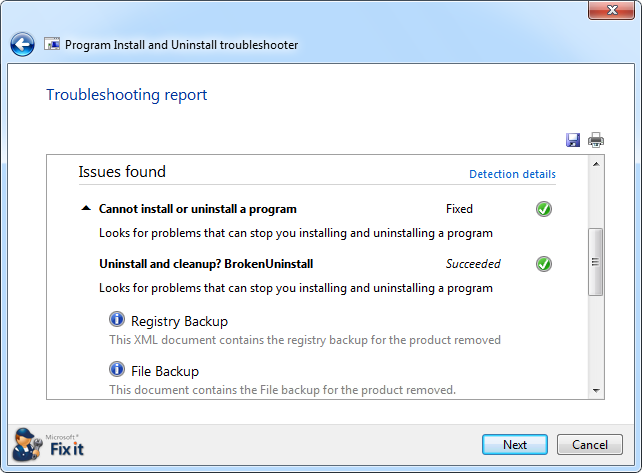 It replaces the Windows Installer Cleanup Utility (MSICUU) which had been withdrawn in June 2010. Unlike MSICUU, the new tool actually tries to fix issues with the Windows Installer registry. If that doesn’t help, the tool makes some efforts to remove the application, while MSICUU only deleted the entry from Windows Installer and left all the garbage behind. In my test, the tool successfully deleted the installed file, but left behind the empty folder in the Program Files directory. It also failed to delete the registry entry my test setup had created and the start menu shortcut to the exe. The new tool also takes precautions like creating a restore point before it starts its work, and making backup copies of the resources it deletes. It even creates an undo script. The tool has an option to automatically fix problems, but I used the second option. 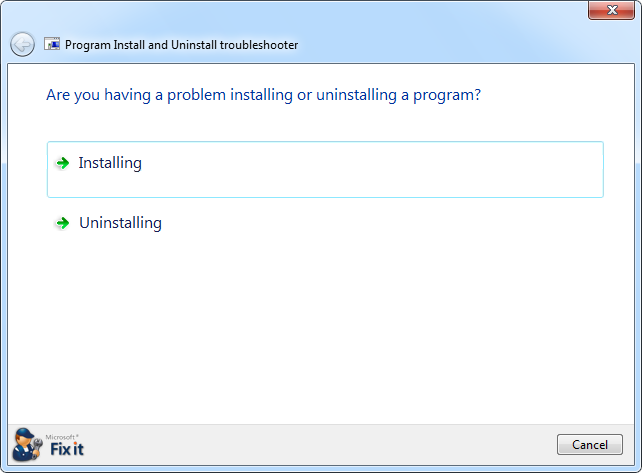 It helps with installation problems as well as uninstall issues. The “Not Listed” option opens a dialog where you can enter the ProductCode GUID of a package you want to uninstall. For testing purposes, I created a setup where uninstallation was intentionally broken (via a LaunchCondition of Not Installed). The summary shows that it created backups of the deleted files and registry entries. However the latter only include Windows Installer’s own entries like those under HKLM:\SOFTWARE\MICROSOFT\WINDOWS\CURRENTVERSION\INSTALLER\… and HKLM:\SOFTWARE\MICROSOFT\WINDOWS\CURRENTVERSION\UNINSTALL\… They entry under HKLM\Software\… which I specified in the Registry table of my msi was left behind. Flexera Software has documented a workaround for this problem in knowledge base article Q212463.